Minister of Public Works Trevor Moniz said that an LED streetlights pilot project — which if instituted effectively could reduce greenhouse gas emissions and energy costs by approximately 50% — launched on Friday. Both BELCO and the Ministry have encouraged the public to comment on the pilot project, which is being conducted by the Department of Works & Engineering and BELCO on Trimingham Road in Paget from 6th December to 31st January 2014. Minister Moniz said, “We are eager to improve roadway lighting in the interest of public safety, as well as to promote energy efficiency, manage costs and introduce internationally accepted standards. “We are very optimistic about the outcome of this joint initiative with BELCO in light of their winning bid for the contract to provide routine streetlight services. “If the pilot is successful, we anticipate rolling out LED streetlights Island-wide over a two-year period,” continued the Minister. 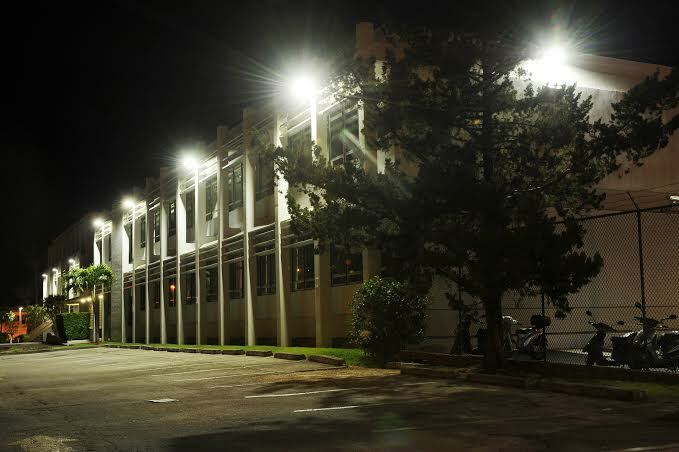 “Full conversion of the approximate 4,000 public streetlights in Bermuda to LED luminaries promises a number of benefits, starting with improved lighting levels. “In addition, because LED luminaries use less energy than HPS fixtures, the change would result in approximately 50% less greenhouse gas emissions and energy costs reduced by approximately 50%. “Maintenance costs would also be reduced, as LED luminaries have an average 20-year life span, as opposed to the average 6-year life span of High Pressure Sodium [HPS] fixtures,” added Minister Moniz. The public is invited to comment via a short survey at www.belco.bm starting December 9th, or by emailing info@belco.bm. A paper version of the survey will be available at the Department of Works & Engineering on Church Street, as well as in the main lobby at BELCO Headquarters on Serpentine Road. A BELCO spokesperson said they encourage the public to comment on their joint LED streetlights pilot project on Trimingham Road, which will continue through 31 January 2014. It involves 14 streetlights, extending from Crow Lane roundabout to Trimingham Hill roundabout; 150-watt, yellow-hued HPS streetlight fixtures are being replaced with 82-watt, white-light LED NXT luminaries, produced by Canadian firm LED Roadway Lighting. “The pilot is expected to demonstrate the efficiency of the LED luminaries, as well as improved quality of lighting on the roadway,” said BELCO. Mr. Speaker, as Minister of Public Works I am pleased to announce the launch of an LED [light-emitting diode] streetlights pilot project conducted jointly by the Department of Works & Engineering and the Bermuda Electric Light Company Ltd. [BELCO]. You may recall that one of the initiatives outlined in the recently delivered Speech from the Throne by the Ministry of Public Works was to move forward with the LED Street Lighting project. To this end I am happy to report that progress is being made at a fairly rapid pace and I wanted to keep the public aware of the same. And for those who may have a copy of the most recent Throne Speech in hand, I was referencing the second paragraph of page 22. The LED pilot project will be conducted on Trimingham Road in Paget from today Friday, 6 December 2013 to Friday 31 January 2014. This pilot project will involve 14 streetlights extending from the Crow Lane roundabout to Trimingham Hill roundabout; 150-watt HPS [high-pressure sodium] streetlight fixtures are being replaced with 82-watt LED luminaries, produced by a Canadian manufacturer which serves over 300 customers in 35 countries. This area was chosen because it is one of the busiest roadways on the island on a daily basis. In the interest of transparency and collaboration, during this pilot, the public is invited to comment via a short survey at www.belco.bm or by emailing info@belco.bm; a paper version of the survey will be available at the Department of Works & Engineering located at 56 Church Street, Hamilton as well as in the main lobby at BELCO Headquarters on 27 Serpentine Road, Pembroke. Mr. Speaker, we are eager to improve roadway lighting in the interest of public safety, as well as to promote energy efficiency…manage costs…and introduce internationally accepted standards. We are very optimistic about the outcome of this joint initiative with BELCO in light of their winning bid for the contract to provide routine streetlight services. If the pilot is successful, we anticipate rolling out LED streetlights Island-wide over a two-year period. Full conversion of the approximate 4,000 public streetlights in Bermuda to LED luminaries promises a number of benefits, starting with improved lighting levels. In addition, because LED luminaries use less energy than HPS fixtures, the change would result in approximately 50% less greenhouse gas emissions and energy costs reduced by approximately 50%. Maintenance costs would also be reduced, as LED luminaries have an average 20-year life span, as opposed to the average 6-year life span of High Pressure Sodium [HPS] fixtures. LED street lighting designed for Bermuda would also include an integrated, wireless monitoring and control system, which has reporting, dimming and metering capabilities. Mr. Speaker, BELCO has undertaken a similar pilot project by testing the manufacturer’s streetlights at their Serpentine Road headquarters. I am made to understand that the results of their pilot…which started in May of this year include 60% energy savings and eight times better lighting levels, when compared to the previous HPS lighting fixtures. Increasingly, LED lights are being installed on public roads around the world in the interest of energy efficiency; for example, announcement was recently made that New York City’s 250,000 standard streetlight fixtures will be replaced with LEDs by 2017. Mr. Speaker, I would like to thank my Electrical Engineering Section, led by the Principal Electrical Engineer, Mr. Jeremy Waters as well as Mr. Denton E. Williams, BELCO’s Chief Operating Officer, whom I have invited to make a public statement on behalf of BELCO regarding this initiative. Always suggested thjs should be done…good to see it finally implemented! ! You’re not taking away anything and making it unsafe, you’re improving what’s already in place cost effectively. Good news. How much will the consumer have to pay for these expensive bulbs? I’m sure BELCO will try and wadge the expenses in our bills…. And you gather that from what? You all like to complain about high electricity bills like you don’t realize the number of the paper is directly related to the amount of electricity you use, the amount of fuel used to make it, and the cost to deliver it to your house. At what cost to there customers ? How about starting in places the street lights aren’t working now? Top of Tee Street, Cavendish Road, several spots of middle road…And don’t put a surcharge on my bill! All some people do is travel in circles!! Switch to the LED lights as the old lights burn out. Isn’t it amazing that no matter what the Government tries to do there are folks out there who will invariably moan and complain. Here we have a project that is being tested in the full light of public scrutiny, using improved technology that is being increasingly used around the world because it is both more efficient, less costly and far more environmentally friendly, and we still have folks who will whine and complain about where it’s being tested (on the busiest section of road in Bermuda) and about the cost (despite the fact that it will be far cheaper to operate than the system presently in use). No wonder we are having trouble reducing our huge national debt. What the Government needs is a gigantic magic wand illuminated with LED lights that can be waved every night to light up the whole Island for free and without any installation costs. But then we would be deluged with complaints about them being the wrong colour, keeping our beloved feral chickens awake, and disturbing our sleep by shining through bedroom windows! And what right does this Government have to openly seek the opinion of the general public in the “cold light of day” before embarking on such a programme. It reeks of transparency and openness, and that is a real electric shock to the system! And in what world is LED more Environmentally Friendly???? In the world of politics of course! This is nothing new, LED street lights are in places across the island already, some powered by solar (also bus stops). This is a re-hash of something already in place being marketed as innovative thinking. The point is, LED street lights have been in use for years, why ask input for their use now? Where any other options besides LED explored? What about due diligance being carried out to have a pilot on all alternative lighting options including LED before a decision is made? Or did the extensive study already do that and this is the finalist? And how much did this cost the tax payer or is BELCO going to offfset the cost and factor it into our bill? As long as these are different from the ones that have been put in various places already. Idk if the new lights that were put up in the Crawl area a while back are the same as the ones on Trimingham road, but the lights in Crawl don’t throw nearly as much light as the old HID ones. Has the government and BELCO thought of placing solar panels on the lightposts? Not always esthetically pleasing but cut the cost of electricity to power the lights to nothing. In my opinion the LED lights are so much better than HPS, if you want to see first hand just take a drive down Northshore Road and take note of how much easier the soft white light is on the eyes than the usual yellow/orange light. I find the older HPS bulbs distort color and reduce accurate depth perception. LED is cheaper to operate and can aid in safer night driving for vehicles as well as for pedestrians. LMAO! So Belco is going to put in LED’s, it’s going to consume less energy, last more than 3 times the lifespan of the current bulbs and gov is still going to get charged the same amount as normal street lights. Or do you think their bill is based on consumption and gets a surcharge too?! Ya ya, I know they’ll be investing in the LED bulbs and need to recoup the costs. Street lighting is fine in urban areas but do we really need to light up everywhere like a mall carpark? Have you all never driven outside of an urban area at night? NO lights at all. Maybe, just maybe there will be a light at intersections. Ever been offshore of Bermuda at night & seen the glow from so many lights on the Island? It has been years since visibility of the night sky has been good because of all of the lights.